I love these, I purchased them in the Cobblestone color the green in the rug matches our bathroom perfectly. The quality is nice, they are heavy and absorb water well. I have one in front of the sink and one by the shower. I am going to purchase a second set for the master bathroom. This 2-piece Boulder Bath Rug Set by Chesapeake Merchandising features a modern stone design that will enrich any space with distinctive style. Your bathroom decor will take on an elegant tone with the addition of these bath rugs. Go ahead and give your bathroom the upgrade it deserves with this two piece bath rug set.We promise that you won't be disappointed as you sink your feet into the plush softness of these rugs after a relaxing shower or bath. This bath rug set are a soft and subtle addition to your bathroom decor. We crafted these bath rugs with plush fabric machine tufted from 100% cotton that cushions your feet for pure comfort. Its water-absorbent construction ensures lasting quality, while a lightly sprayed anti-skid backing helps keep your rugs securely in place. The 2 piece set Includes a 21"x 34" and 24"x 40"rug. i like the pattern on the rugs and the sizes were just what i needed. However, the size on the large rug is incorrect, my small rug is indeed 21x35, but the large one is only 24x41 1/2. the sizes were one of the determining factors in my purchase of the rugs and the large one falls short of expectations. still debating on whether or not to return it. other that the size issue, the rugs are great. decent pile, soft, but the bottom of the rug is slick, it does not have rubber backing. another reason i am deciding if i should return them. I am going average on these rugs because the first time I vacuumed them a lot came up. We will see after the second vacuum. That said, I like the colors and they look great in the bathroom. 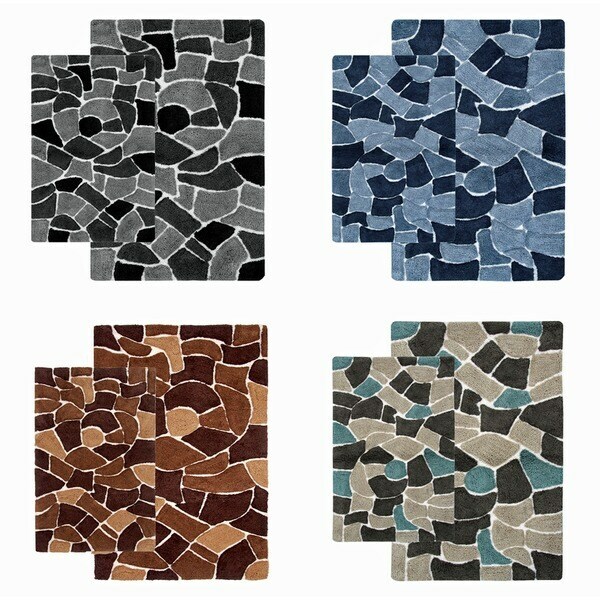 Although the colors are perfect for my guest bathroom these rugs are not very plush or soft on feet. I am keeping it for the colors and because this bathroom is not used often. Also I did not receive the "free" step out rug in my shipment, I had no place for it anyway, so didn't really matter. Was looking for comfortable & high quality bath mats, and these fit the bill. The colors look exactly as they do online. Very happy. These rugs add a perfect touch to my bathroom. They are soft an absorbent. First time I washed these rugs there were hand fulls of rug fabric all over the rugs and my machine. Haven't washed yet, so can't fully evaluate, but the colors are muted so not quite as bright as I anticipated. The step out bath mat is a nice bonus. These diss not hold up well at all. The pattern was interesting but the rugs started to unravel after one washing and after 6 months they all had to be replaced. These rugs are a little thin and the color is dull. Not a true vibrant black. If your looking for lighter colors it will be perfect. They don't slip and seem to dry fast. The rugs look exactly as pictured. However, the quality of the rugs is very poor - after one washing, the rug shed and fibers came apart. I'm very disappointed! poor quality I had to return this. "When will you have the cobblestone slate back in stock?" Hello divine311, items are restocked as they become available; however, we cannot guarantee an item will be restocked. Thank you for shopping with us. "Do you have smaller rugs with the blue cobbles stone? Like 21" x 30"? I can only fit the 30" wide. These colors would be PERFECT in my bathroom!" Hello jgj333aolcom, we do apologize, this item is not currently in stock in a 30 inch width. Thank you for shopping with us. "which color is which? I can tell the brown and I'm guessing the grey is the black/grey. I'm interested in the one that looks like light blue and dark blue." Hello ImissTigger, we appreciate your inquiry. That would be the silver blue option.We hope you have found this information helpful. Thank you for shopping with us! "What color scheme is the brown beige and blue? Also what shade is the blue?" Hello teamashley, we try to represent the colors of our products accurately. Unfortunately, due to the difference in monitor colors we cannot guarantee that the color will match exactly what you see on your screen. Thank you for shopping with us. "I need one of the large rugs and 2 of the smaller rugs, is there any chance of purchasing a second smaller rug separately?" Thank you for contacting us, doclb. Unfortunately no, these only come in a set. Please let us know if you have any further questions.